Editor's Note: Sudan and South Sudan policy analyst Akshaya Kumar's op-ed originally appeared on the Daily Beast. At the end of October, I wrote about how the Satellite Sentinel Project observed ominous troop movements that warned against an impending attack on civilians in Sudan’s South Kordofan state. Since then, the Sudanese government has launched a multi-front military campaign in the area. At the same time, it has escalated the tempo of aerial bombardment and resumed its scorched earth campaign against civilians. South Kordofan Governor Adam Al-Faki has vowed to conduct a “comprehensive cleanup campaign” and the Minister of Defense said his troops will “not stop until we crush them.” We predicted these developments, but we didn't want to be right. Without a commitment from international policymakers to push for real change, this deadly violence will continue. 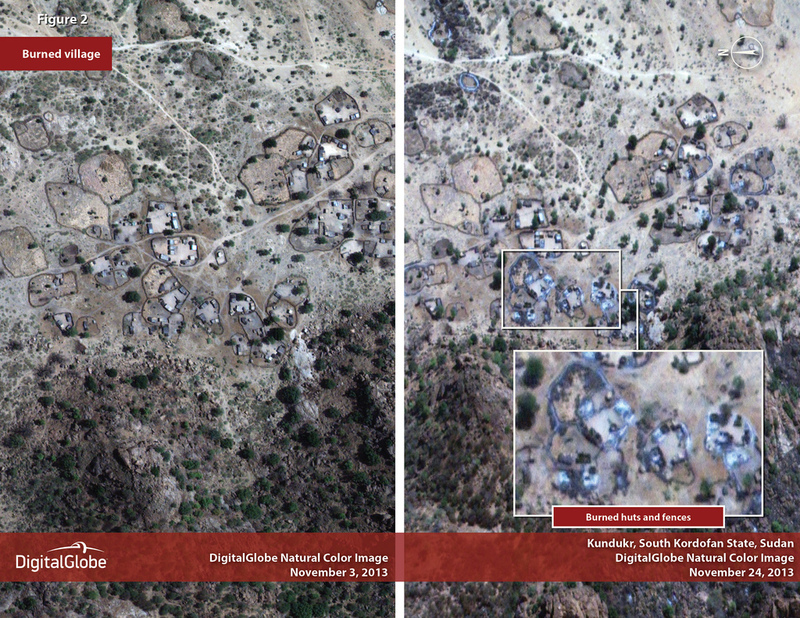 The Satellite Sentinel Project, or SSP, a partnership between the Enough Project and private satellite operator DigitalGlobe, has pioneered the use of satellite technology to respond to atrocity crimes. While Human Rights Watch and Amnesty also analyze archival satellite imagery to document human rights abuses and war crimes, our program has the capacity to select which part of Sudan to image on a daily basis. When combined with information from an extensive network of human-rights monitors and citizen journalists within Sudan, this tasking capability means that the Satellite Sentinel Project curates an almost constant stream of imagery corresponding to the latest developments in the country. As a consequence, SSP can issue early warnings to civilians at risk. Unfortunately, neither documentation efforts nor early warnings can stop the violence for good. Every day now, SSP sees more bomb craters, burned villages, and scorched earth in Sudan. Mirroring its engagement on Syria, Egypt and Iran, the United States must do much more to address the root causes of violence and repression in Sudan. Last week, SSP satellites caught Sudan Armed Forces, or SAF, in action as they burned civilian dwellings in the town of Kundukr in South Kordofan state. This imagery shows SAF troops on the scene as huts smolder in the aftermath of their assault. At least 142 homes are already burned as SAF forces refueled their vehicles. No rebel troops were detected in the area at the time of the attack. This type of indiscriminate violence against civilians in its conflict zones has become the hallmark of Sudanese government campaigns. Clashes between the Sudanese government and the Sudan Revolutionary Front, or SRF, rebel coalition further exacerbate the deepening humanitarian crisis in Sudan's war zones. In the four-day period of November 21 and 25, violence displaced some 25,000 civilians from the Nuba Mountains. Images from November 17 show huge impact craters in Buram county in South Kordofan state where just two bombs obliterated the area of an entire football field. According to military experts, based on the pattern of the craters and video evidence of the attack, these bombs were probably dropped by Fencer Su-42 planes, which Sudan acquired from Belarus earlier this year. In August, the Satellite Sentinel Project was the first to secure independent confirmation that the new Fencer aircraft were in Sudan and on the runway. A loophole in the U.N.'s arms embargo on Sudan allows this sale, as long as Sudan promises that it will not use its newly-purchased planes in Darfur. This fig leaf of legality must be stripped away, otherwise violence will persist. Read the full post on the Daily Beast.